Many financial services providers are interested in reaching lower-income underserved markets. Not all such providers are responsible players motivated by a sense of corporate social responsibility. 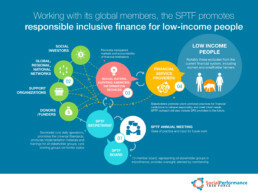 The Social Performance Task Force is a global consortium of multiple stakeholders—financial institutions, investors, auditors and raters, and many others—all working collectively to advocate for socially responsible financial services. Anne Folan & Associates recently designed a comprehensive communications strategy and related collateral. Anne Folan & Associates exists to help our clients inform and inspire their audiences. We are passionate about creating work, written or visual, that connects with people at both the intellectual and emotional level. Whatever we produce—graphic design, video, publications, speeches, presentations—our mission is to communicate our clients’ messages in ways that engage and delight.